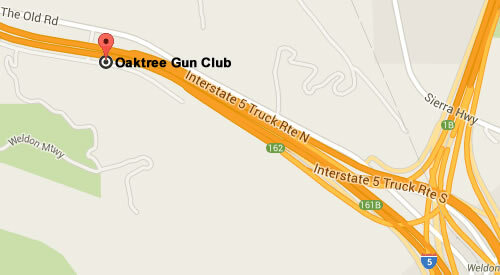 Oak Tree Gun Club's Pistol Range is unlike any other in Southern California. Our outdoor venue features a total of four pistol bays, which are designed to provide our shooting guests a comfortable, covered, shooting position, without obstructing the natural backdrop. Pistol Bay 1 can accommodate both pistol and rifle shooting, and offers a shooting distance of up to 60 yards. Pistol Bays 2 and 3 are a perfect location to record your accuracy and precision, where paper targets can be set up from anywhere between 3 to 25 yards. Any of our paper bays can also be reserved for private use. Oak Tree's Signature Steel Gallery features unique steel targets on every shooting position. There are approximately 200 interactive metal targets including swinging gongs, bifurcated bulls eyes, moving ducks and rabbits, and many other targets familiar to cowboy-action shooters. Oak Tree's steel gallery also has two falling plate bays with timed targets. Our steel gallery allows for use of lead core ammunition, from .22 caliber to 45 ACP, and we allow rapid fire, perfect for the shooter who is working on proficiency and speed. If you are looking to shoot magnum loads, Oak Tree Gun Club's Paper Bays at the Pistol Range can accommodate anything from 22-caliber long rifles up to 500 Smith and Wesson's. We offer competitive pricing and a large selection of ammunition of all calibers, including Oak Tree's signature brand ammo. Our Pistol Range also offers the largest selection of the most popular handguns for rent, so we encourage you to "try before you buy," or simply enjoy shooting some of the firearms you have always wanted to shoot. Oak Tree Gun Club's qualified staff is committed to assist shooters of any experience level, and make your visit a safe and enjoyable one. $20.00 per adult shooter: covers the Pistol range fees. $10.00 per Child 9-13 years of age (with a paid adult). Free per Child 8 or younger (with a paid adult). *Premium Rentals Available, Extra Fees May Apply. Unlimited use of tactical bay 1. Unlimited use of paper bays 2 and 3. Unlimited use of the rifle range. Unlimited use of all rental handguns, shotguns, rifles and bows. Half Price Range Fees at Archery. Members also receive a 10% discount off of Oak Tree's signature brand ammo. Members are guaranteed a fast check-in without the hassle of filling out daily waiver forms. **Memberships which were purchased during "PROMOTIONAL SALES" (IE: 2 FOR 1 or 1/2 PRICE) and whose cards are labeled "PROMO" will NOT receive the 1 free firearms transfer per year.